The idea of creating a website from scratch is a nightmare for most architects. There’s no shame in that. While one could say that there are some transferable skills between architecture and web design, the reality is that your time is far better spent on building your business than building a website. But conversely, you need a website to help build your business. In our Internet-driven age, it cannot be avoided. Fortunately, there is a simple solution. In case you are on a low budget or just starting your business: you can in fact create a professional website for your architecture business – quickly, inexpensively and easily, and without any design or technological skills – in less than 30 minutes. And in this step-by-step tutorial we are going to show you exactly how. 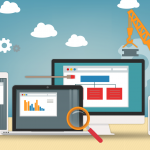 How Much Can Setting Up Your Own Website Save You? According to Executionists, a first-time or small business website can typically cost anywhere from $5,000 to $13,000. While this number includes a domain name subscription and web hosting – two things you must pay for – there is no logical reason for you to spend thousands of dollars on your business site when you can simply choose a pre-built template and be up and running before your next cup of tea (or coffee). So let’s get to it! Note: This tutorial is for complete beginners, so you don’t have to worry about any previous knowledge in terms of building websites. We’ll walk you through publishing your website so you can save money and market to your clients within 15-20 minutes. If some of the steps are not clear or confusing, just email me (“peter at archisnapper dot com”) and I’ll correct this blogpost accordingly. We’ll clarify all those things here below. A hosting account is basically where your website lives. Hosting companies manage large servers to run thousands of websites, make sure that they run quickly, and are safe from intruders. Each website has a database and files, and the host stores these components for a small fee. 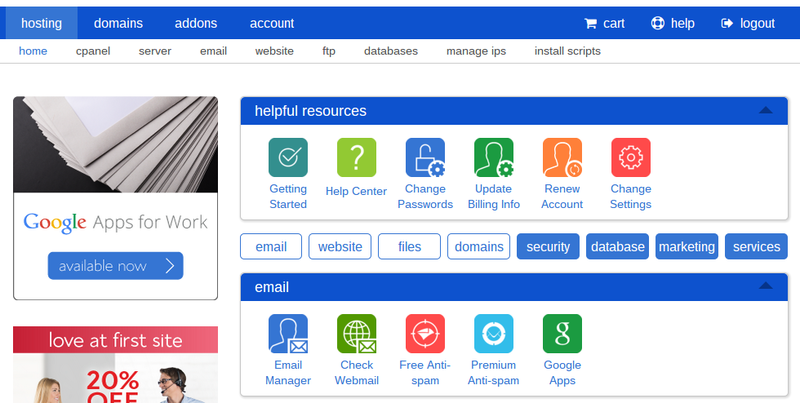 To start, go to Bluehost and click on the big Get Started Now button. We specifically recommend Bluehost as our provider of choice because their service is fast, secure and reliable – not to mention that they are one of the least expensive web hosting providers around. They are also very easy to work with for beginners (no technical knowledge required). After you move on from the initial page you can select the plan you want to opt for. 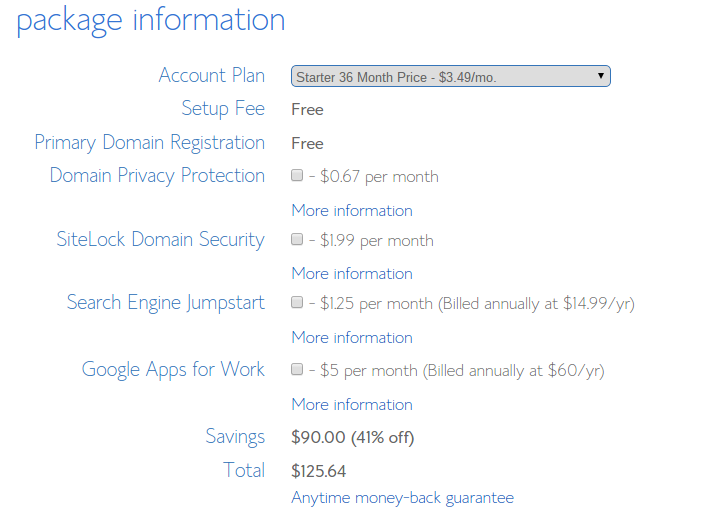 Bluehost has monthly plans, but they always make an upfront charge for the year. This is how they keep their costs so low. I would recommend going with the Starter plan to test the waters – you can upgrade at any time. Make your selection and click on the Select button to move on. 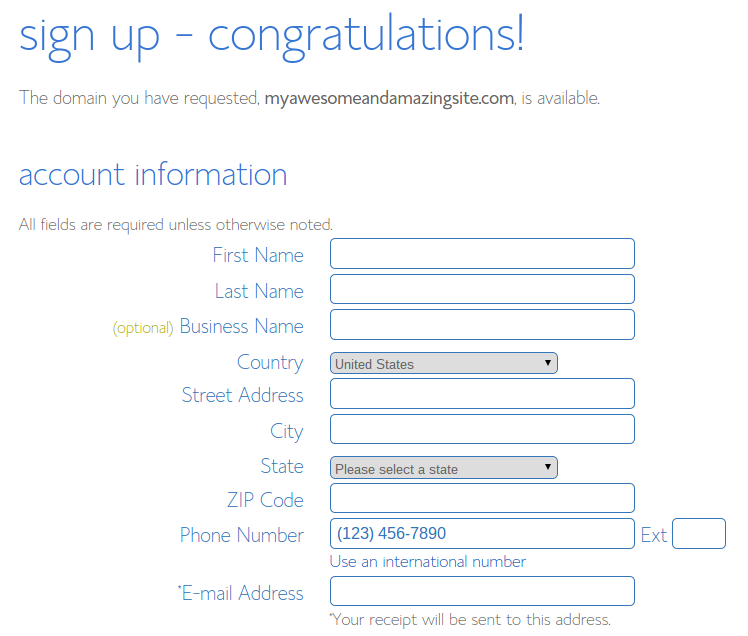 This page asks you to choose what domain name you want to assign to your website. 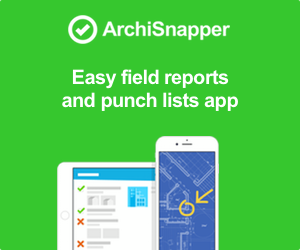 This is typically something like “www.your-company-name.com“.For example, our website’s domain name is archisnapper.com. You may also have a domain that you previously purchased from a source like GoDaddy. Feel free to transfer a domain that you paid for before on the right-hand side. Keep in mind that if you’re grabbing a new domain, it’s completely free with a new hosting account in Bluehost. Sometimes you have to try a few domain names to find one that’s available, so keep clicking on the Next button. Once you receive a confirmation screen that a domain name is available, you get sent to a new page for typing in your personal information. This information is only used by Bluehost to offer you better support. For example, they can quickly see who you are whenever you start chatting with them online. Next, confirm which Bluehost package you want to pay for. 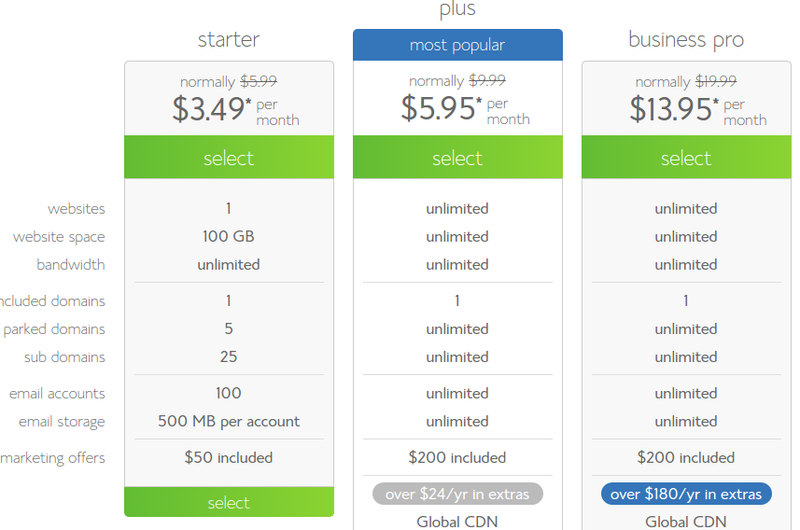 As stated before, Bluehost charges you upfront, so you won’t be billed on a monthly basis. They break the savings down by month so you can understand that signing up for a longer period is always better value. 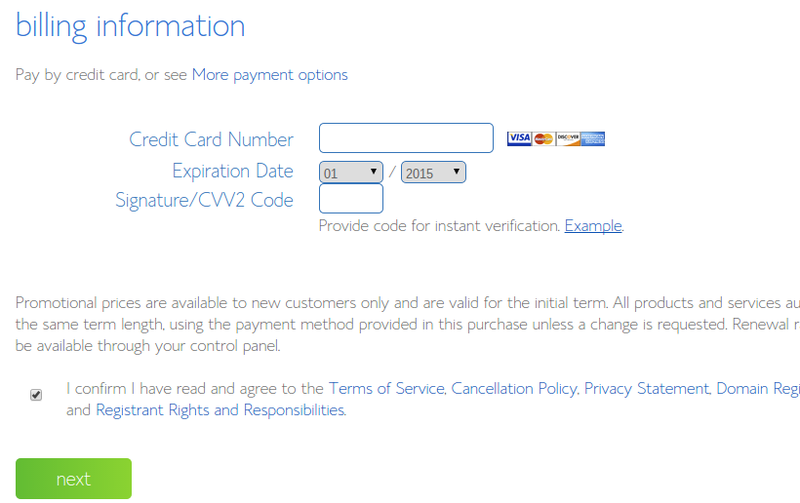 The final step here is to fill in your credit card info and click on the Submit button. Scroll down to the Website sub-header and click on the Install WordPress button. This is considered a one-click installation process, so you don’t have to mess around with any file transfers or coding. On the next page click on the Install button. 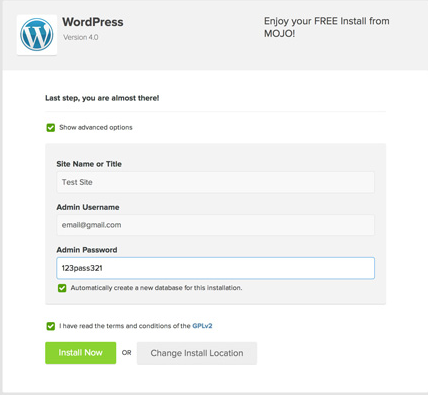 Now you can choose which domain name you want to install WordPress on. You might only have one to choose from one if this is your first website through Bluehost. Click the Check Domain button. On the next screen, select the Show Advanced Options box and fill in the admin credentials. What does this mean? This is the admin username and password you will use to login to the backend of your WordPress website. You can always change the Site Title later on. You should see a meter at the top of the page telling you that WordPress is being installed on the Bluehost servers. Once the following banner shows up at the top of your screen, click on the View Credentials button. This reveals your admin URL and front-end URL of the website. The front-end URL is where people can go to visit your website, and the admin URL is for you to login to the backend and do things like upload images, create posts and modify menus. Regardless, you want to write down and remember both of these URLs because you will be visiting them quite a bit. Click on the Admin URL link to login to your website for the first time. 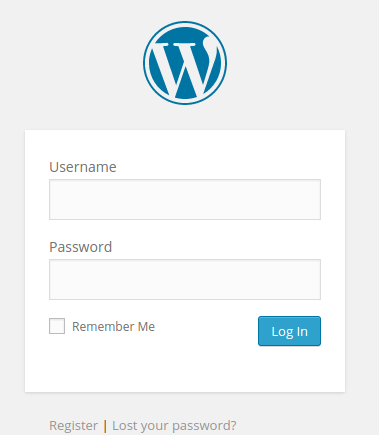 Type in the username and password we talked about before to view your WordPress dashboard. Once you get in there you will see that you can complete many tasks like creating posts, building pages and generating menus. Start by playing around with the toolbar on the left-hand side. You can also install plugins, which are addons for making your site better, with items like contact forms, SEO components, and widgets. 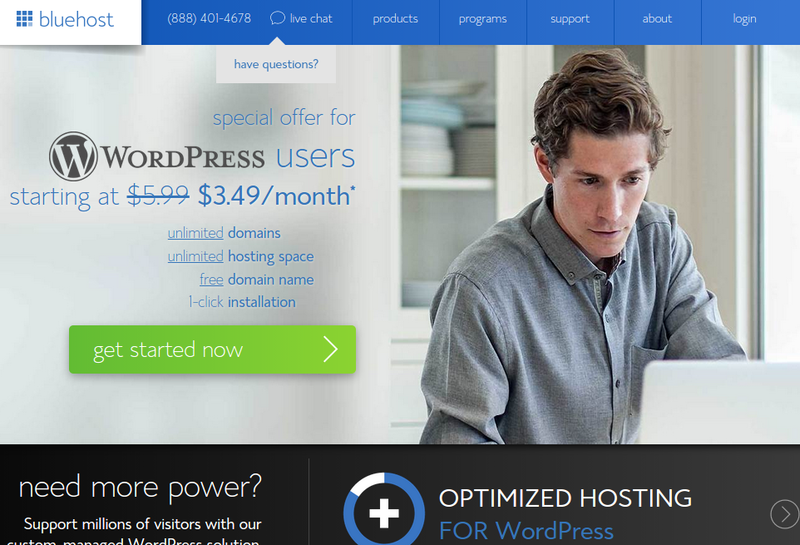 Now that you’ve setup your hosting and WordPress, you are all set with a fully functional website, right? Well, not so fast. Your site probably doesn’t look like much right now, so it’s wise to select a WordPress theme to add some branding, colors, text, and images. A theme is basically a pre-built website design (for WordPress) that is sold for a relatively cheap price (or completely free). The cool thing about themes is that most of them look awesome, and you can easily install and remove them. Check out our lists of the best WordPress themes for architects to get a head start. If you still can’t find a theme that you like, try searching Theme Forest. They offer stunning themes for affordable rates. 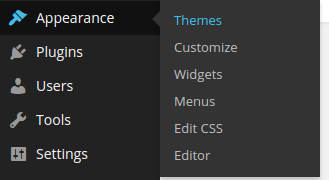 In order to install a theme, navigate to Appearance > Themes on the left-hand side of the dashboard. Once you land on this page you have a couple of options. 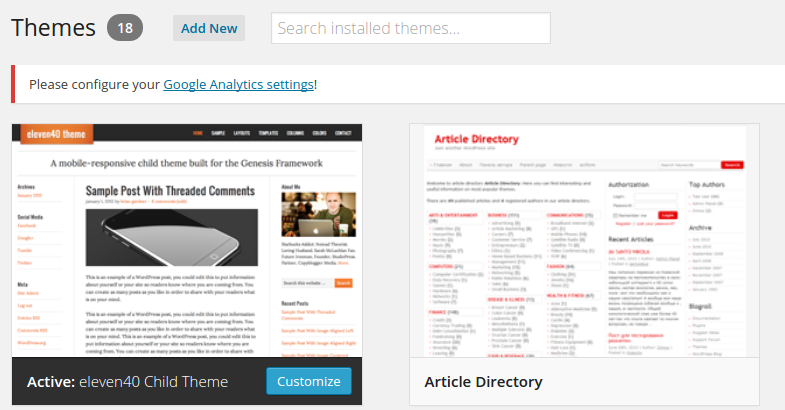 First, you could search for a free theme in the WordPress repository. These can be good, but are not often as well-designed or functional as premium themes. We would recommend choosing an affordable premium theme and sticking to it. On this page you can also click on the Add New button at the top, which then asks you to upload the file for your zipped theme file to the WordPress dashboard. Once your chosen theme is uploaded and activated on your site, the next step is to add content. This is not to be underestimated, since good and decent content still requires a lot of work, finetuning and iterations. But providing content would be anyhow part of the job, whether you would have your website built by someone else, or would build it yourself. Little hint: add a blog section to your website, and write at least 1 blogpost a month (more is better). Share knowledge, facts, ideas, thoughts, or just anything. Clients LOVE websites that are “alive” and have a blog section where they can have a look behind the scenes on what is going on. Consider this: would you rather trust a company where the latest blogpost was in June 2011 (about an out of date technology), or where the latest blogpost happened to be 3 days ago (about a relevant topic in today’s world)? That’s literally all that’s stopping you from having your architecture firm’s website up and running for potential customers to see! All for a few bucks – far better than the thousands you may have considered spending (unless you are a well established big company). Use the tutorial above to set up your own architecture website and save thousands of dollars (for starters or people on a low budget). Start the process with an idea of what domain you want to choose and what content you plan on having on your website. 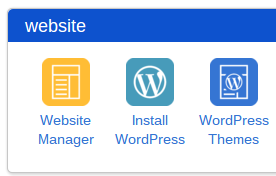 Then you can link up a hosting account like Bluehost and install the WordPress software within just a few minutes. 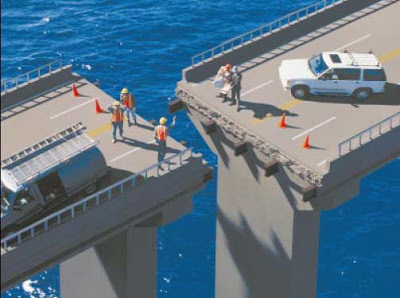 Your architecture business is filled with costs, but a website shouldn’t be one of the higher ones. That said, let us know in the comments section if you have any questions about how to set up your site. If something is not clear in this tutorial I will try to personally help you + adapt this blogpost. Scout promise!